In this workshop we will be working with beautiful silk mesh which is lustrous and has a beautiful soft drape. The students we be using free motion embroidery techniques and capturing hand dyed silk fibres between layers of water soluble fabric, they will be cutting through the layers of silk and then stitching forming a lacework appearance. There will be touches of freemotion stitches hand dyed and added to the surface of the scarf to enhance the design and colours. There is a lot of stitching in creating the scarf and when finished it will be reversible and luxurious. 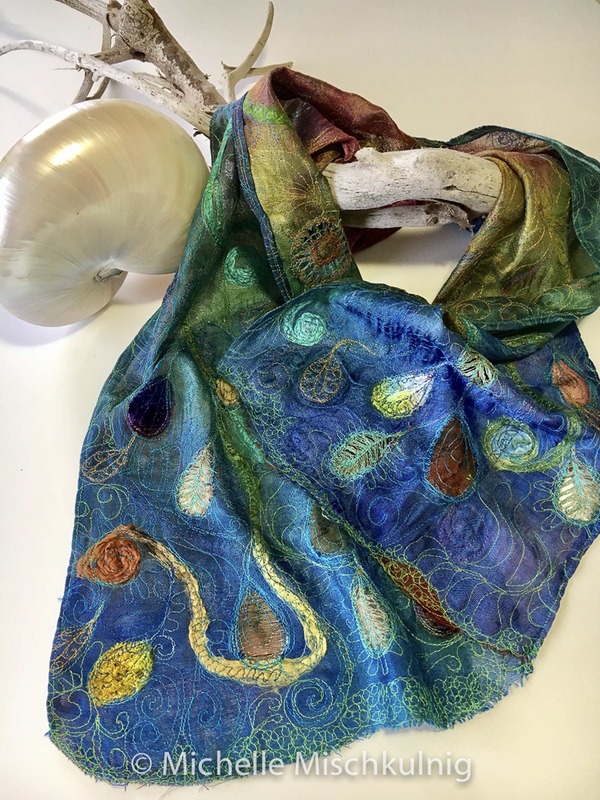 The bag is made from the same hand dyed silk mesh and the students will explore the drapes and folds in this versatile fabric and how to embrace these folds and make a beautiful special occassion bag.